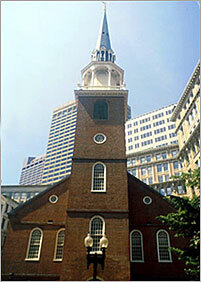 Built in 1729 as a Puritan meeting house, Old South Meeting House was the stage for some of the most dramatic events leading up to the American Revolution. None was more important than a meeting that occurred on December 16, 1773. Over 30 tons of taxable tea sat in the holds of three ships, the Dartmouth, Eleanor, and Beaver, moored at Griffin’s Wharf. Not wanting to pay the onerous duty, thousands of Bostonians crowded into Old South Meeting House to take part in a heated discussion of what was to be done with the tea. After the failure of a final attempt to have the tea sent back to England, Samuel Adams addressed the crowd saying, Gentlemen, this meeting can do nothing more to save the country. These words were rumored to be a secret signal to the Sons of Liberty. Cries of Boston HarbourÂ—a tea pot tonight were heard throughout the hall, and men disguised as mohawk Indians marched down to Griffin’s Wharf to witness the fateful destruction of 342 crates of tea. It became known as the Boston Tea Party and set that stage for American history. 1729년 청교도의 교회로 사용되기 위해 설립되었으나 보스턴 시민의 집회소로 이용되었던 곳입니다. 식민지였던 시절 영국 정부의 부당한 과세에 분개한 보스턴 시민들이 모였던 것을 시작으로 특히 1773년 새뮤얼 애덤스의 연설로 인해 보스턴 티파티 사건이 일어나 더욱 유명합니다. 현재 집회장 안에는 미국독립에 관한 자료가 전시되어 있고 그때의 토의 모습을 재현한 테이프도 들을 수 있습니다. 미국 독립혁명의 시발지인 이곳은 미국역사의 사적으로 많은 사람들이 찾는 명소입니다. 오픈 : 4~10월 9:30㏂~5:00㏘. 11~3월 10:00㏂~4:00㏘.